The Five Families Productions, LLC is a film production company that focuses on documentaries, commercials, and business marketing materials. Their online presence is vital to attracting new clients and investors. 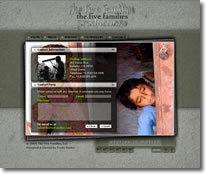 Working together with the Trade Studios design team, The Five Families now has an interactive, media-rich, Flash website designed to portray their artistic style and professionalism.